Helping middle and high schoolers understand mental illness makes a big difference. We can teach them about the warning signs for themselves and their friends. NAMI Ending the Silence helps raise awareness and change perceptions around mental health conditions. Through this free classroom presentation, students get to see the reality of living with a mental health condition. During the 50-minute presentation, a young adult living with mental illness and a family member tell their stories about mental health challenges, including what hurt and what helped. Contact NAMI Illinois to find an affiliate in your area that offers NAMI Ending the Silence. NAMI on Campus provides information and resources to support students living with mental health conditions and to empower them to take action on their campuses. 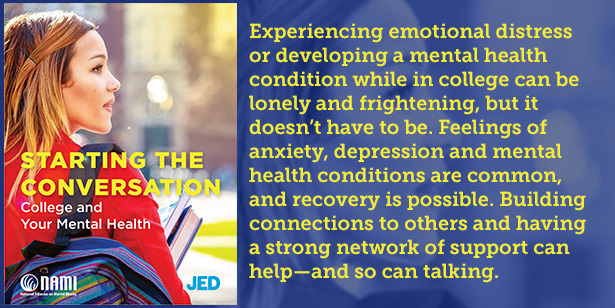 This site also includes materials to help colleges in improving the academic and social experience of their students by addressing the mental health needs of all students. For more information, click here. Why start a conversation about mental health? To help put a thoughtful plan into place should a mental health condition arise, NAMI (the National Alliance on Mental Illness) and The Jed Foundation have created this guide to help start the conversation. It offers both parents and students the opportunity to learn more about mental health, including what the privacy laws are and how mental health information can be shared. Conversations allow you to plan for the unexpected; to know what to do if you develop emotional distress, a mental health condition or if an existing condition worsens. Talking about mental health is important even if you don’t experience a mental health condition because a friend may need help. Students often prefer to confide in a friend before confiding in anyone else—or you may notice that a peer is struggling and you may be able to assist. By learning more, you’ll be better equipped to know what to do if you or a friend is in distress. Copyright © 2019 NAMI Illinois.